Rarst ran a little review of the MAC address changing software program Mac MakeUp today. If you have not checked out his website you might wanna do so as he constantly covers interesting tools and services there. Back to the software program. 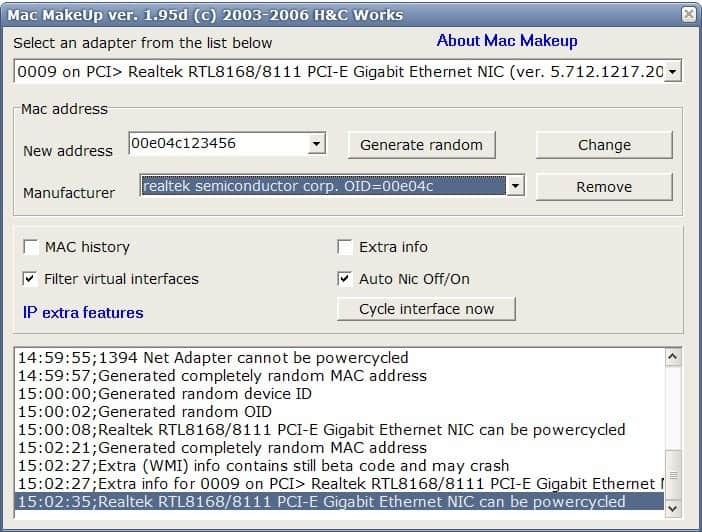 Mac MakeUp is a portable software for the Windows operating system that can change the Mac address of a network adapter. The Mac address can be described as a parameter that gives network adapters a unique ID. You might have heard about them in the context of wireless networks and Mac address spoofing. The Mac Address Changer may be useful to change the Mac address regularly to make identification more difficult. After starting the software program it displays the connected network adapters in a pull down list on top. It provides the means to generate a new random mac address for the selected network adapter, or enter one manually. It is also possible to pick a manufacturer from another pull down list to add the manufacturers code to the beginning of the Mac address. The last six digits are 123456 which can be replaced with a combination of the user's choosing. Virtual devices are filtered by the application by default, but you can show them when you uncheck the "filter virtual interfaces" option in the program interface. The software program provides access to advanced options which are available by clicking on the IP extra features link in the main interface. There you find listed quite a few advanced options that change certain networking related parameters and options. The program color codes them to differntiate between defined and undefined parameters and features. It is recommended that you hit the "backup current settings" button first before you make any changes to the settings on the screen. Those are best kept alone by inexperienced users as they can cause networking problems easily if changed to the wrong or incompatible values. Thanks for always being supportive to my blog and sending awesome readers my way, Martin! Nothing beats quality of traffic from fellow tech blogger. Well, shareware does tend to be better at times. :) But you know, comes with a price tag thing.